April is the best month to get married in Rome. Weather is almost always fantastic, fresh, sunny, with clear blue sky and trees in blossom. In the photos below you can see our beautiful couple: the bride is Russian, the groom is Italian. They got married in Rome in April 2016. Irina, the bride, is a very beautiful girl with olive skin and long dark hair, so together with her we decided to do something really elegant but simple at the same time. 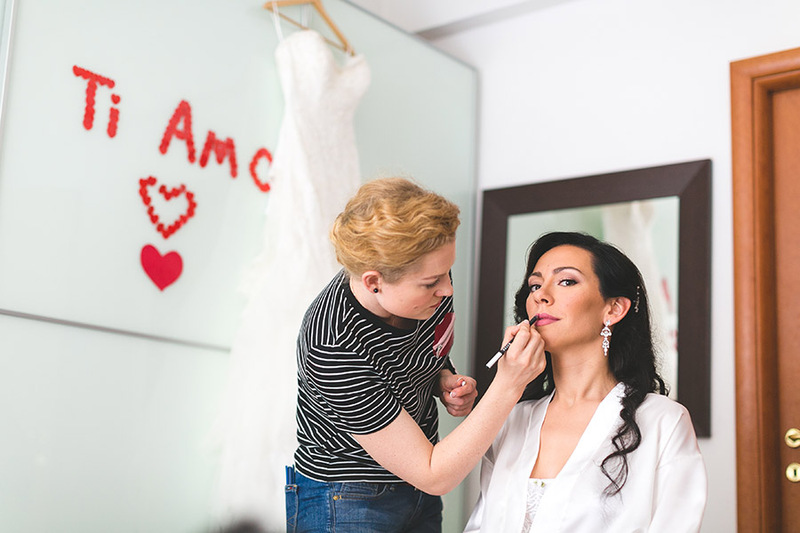 For her wedding make up we chose neutral shades in purple and pink, matte eyeshadows, a good long-lasting foundation that made her skin look healthy and very radiant, a pink blush for her cheeks, false eyelashes and a black eyeliner to make her eyes more expressive. For her lips, a natural colour lipstick by Mac. All products I used were by Mac, Clarins, Too Faced and Guerlain. For her wedding hairstyle, she wanted to keep her hair loose as it is very beautiful and long, so I styled them with natural curls, just some pins on one side and a nice hair accessory. As a whole, her look was very harmonious with her elegant wedding dress!